The Central Sheep and Wool Research Institute is a premier Institute of Indian Council of Agricultural Research (ICAR) engaged in research and extension activities on sheep. It was established in 1962 at Malpura in Rajasthan. Now campus is popular by the name of Avikanagar The campus is located at 26° 12' 52.2" N (26.2145° N) latitude and 75° 45' 24.84" E (75.7569° E) longitude at 320 meters above mean sea level . The campus is spread over an area of 1510 hectare. It has three Regional Research Centres in different climatic zones of the country to develop region specific technologies. North Temperate Regional Station (NTRS) was established in 1963 in temperate region at Garsa, Kullu in Himachal Pradesh. The Southern Regional Research Centre (SRRC) was established in 1965 in sub temperate region at Mannavanur in Tamil Nadu. 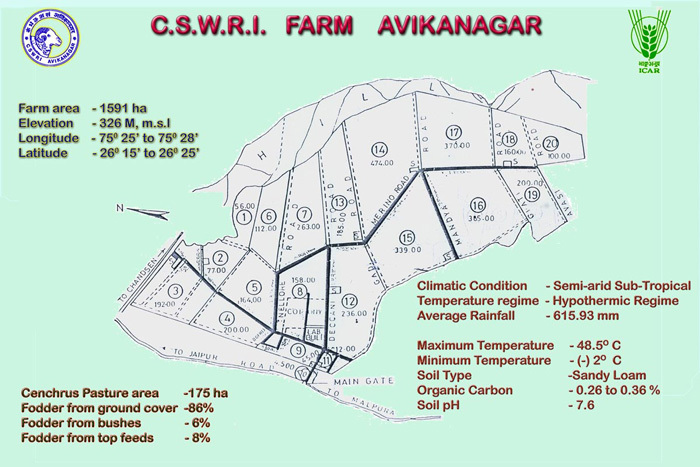 Arid Region Campus (ARC) was established in 1974 at Bikaner in arid region of Rajasthan. The Institute and its sub-stations have been working for enhancing the productivity of sheep by applying scientific methods and developing new technologies. The Institute has developed new strains of Avikalin for carpet wool production and Bharat Merino sheep for fine wool production in temperate climate. The scientific breeding, feeding and management practices were developed for improving the production traits of Malpura, Marwari, Magra and Chokla sheep. A prolific sheep from crossing of Malpura, Garole and Patanwadi breeds has been developed and its performance evaluation is ongoing under semiarid climate. Some of the important technologies developed by the Institute are: Intensive lamb production for mutton, complete feed block for scarcity feeding, artificial insemination, embryo transfer technology, indigenous sponges for estrus synchronization, area specific mineral mixture, cost effective worm control program, disease data information system for organized sheep and goat farms and wool hair blended woollen products and meat and meat products.